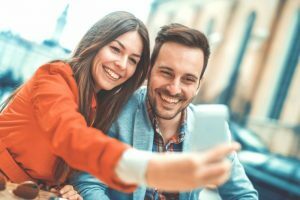 In just six months, you can enjoy a lifetime of straighter more symmetrical teeth with the Six Month Smiles system designed specifically to work on the front teeth. This fixed orthodontic appliance achieves great results for adult teeth and is a popular, affordable solution to correct cosmetic issues. Designed specifically for people aged over 16, Six Month Smiles utilises the latest in orthodontic technology to move teeth into place. Six Month Smiles is made from a clear material, which is discrete and less noticeable than a traditional metallic brace. The wire which attaches to the brackets is very thin and coloured to match the teeth. This system is ideal for people who want to create a straighter smile but do not have complicated bite problems. Once treatment has been completed and the fixed brackets removed, you will need to wear a retainer to make sure your teeth stay in their new position.